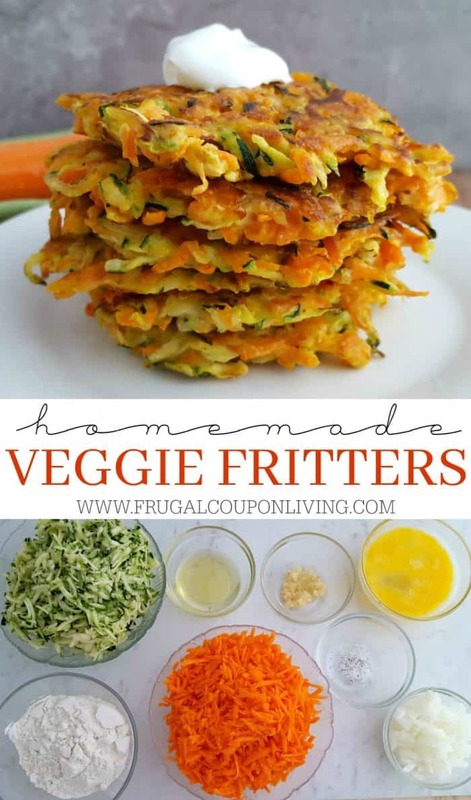 Easy Veggie Fritters - The Kids Will Love Them! Easy Veggie Fritters – The Kids Will Love Them! 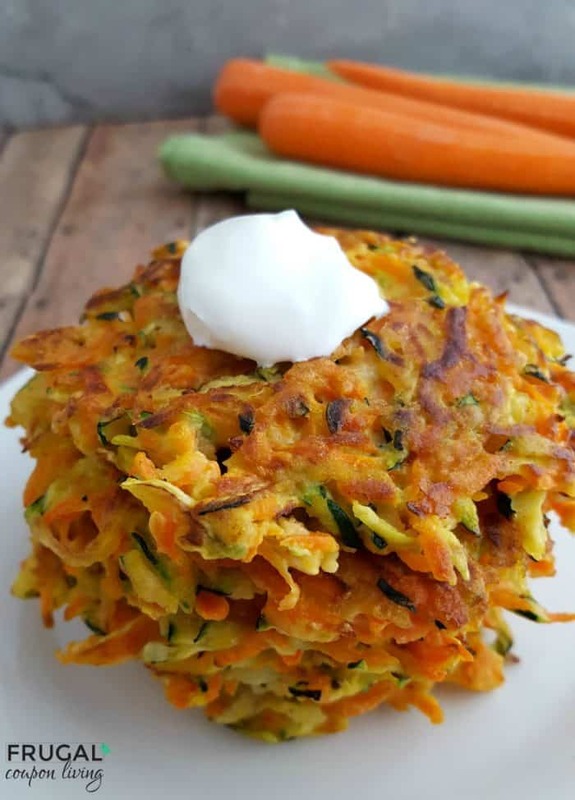 Easy Veggie Fritters recipe with carrots, zucchini, and beaten eggs. Your kids will love this veggie recipe on Frugal Coupon Living. If your kids love string hash browns, give these veggie fritters a try – we bet the kids will love them too. We mixed zucchini, carrots, and eggs to make these delicous patties. Top with sour cream, Greek yogurt and/or chives. Enjoy! Optional: Sour cream or plain Greek yogurt for dipping. We like to add chives too! Place the zucchini in a strainer over a bowl. Gently press down to squeeze the excess liquid out. In a medium bowl, add the strained shredded zucchini, shredded carrots, flour, scallions, eggs, garlic and salt and pepper. Stir well to incorporate all ingredients. Place paper towels over a large plate, set aside. Add the olive oil to a large sauté pan on medium-high heat. Once the oil is shining in the pan, add about ¼ cup of the mixture into the pan, flattening it just a bit with your fingers. Continue adding the mixture as stated, spacing the fritters about 1 inch apart. Allow the fritters to cook for approximately 3 minutes, and then flip to cook the other side for 1-2 minutes or until golden brown. Place the fritters on the prepared plate to allow the excess grease to drip off. Continue this process until all of the vegetable mixture is used. Optional: Serve with a dollop of sour cream or plain Greek yogurt. You can also top with chives. Note: These are best enjoyed immediately after they are prepared. Don’t forget our Corn Lollipops. Pin to Pinterest. 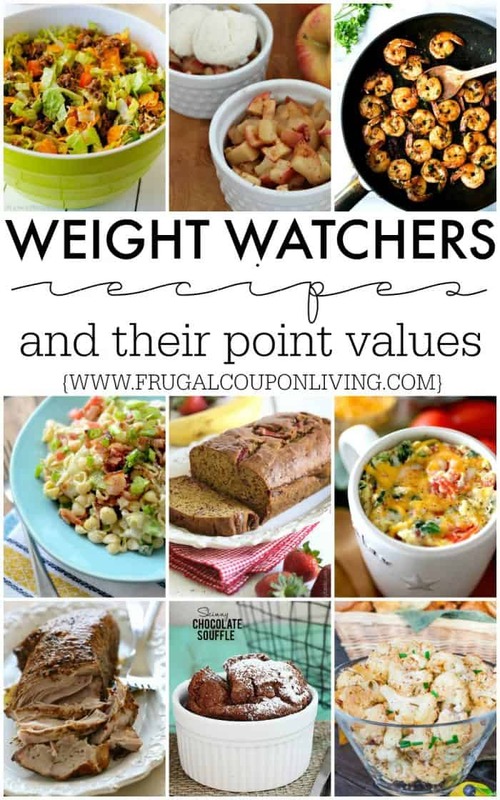 Take a look at these Weight Watchers® Recipes and Their Point Values. Pin to Pinterest.